The 400 MW Seli hydroelectricity project is a Run-of-the-river project proposed on the Chenab River in District Lahaul-Spiti of Himachal Pradesh. Chenab river basin is one among the major five river basins of the state, and also the least exploited in terms of hydropower development. Out of 27,400 MW- the total identified potential of Himachal Pradesh, the Chenab basin holds about 4,032 MW. In the high altitude zone of Lahaul and Spiti, the HP government has allotted 32 hydroelectricity projects- the 400 MW Seli being one of them. The 400 MW Seli project was allotted through International competitive bidding process to Hindustan Powerproject Private Limited (HPPPCL) by the Government of Himachal Pradesh. The 120 MW Miyar project proposed on the Miyar stream is another project under execution by HPPPCL. The 400 MW Seli was recommended clearance for pre- construction activities in 2010 in the 35th meeting of the Expert Appraisal Committee (on 18-19th February). The public hearing was conducted by Himachal Pradesh Pollution Control Board (HPPCB) on 18th November 2011 at Madgran, Tehsil Udaipur. It was in 2013 that the project was granted environmental clearance by the Ministry of Environment, Forest and Climate Change (MoEFCC). The project was also granted Stage I forest clearance on 1st July 2013. A total of 276.18 hectares of forest land will be diverted for the project whereas the total private land involved is 16.1 hectares. • On ground, the project has witnessed heavy opposition by the public and local environmental justice groups ever since the survey and investigation phase. The local ejo's also registered strong protests during the Environmental public hearing for the same. One of the foremost issues raised was the acquisition of forest land for non forest purposes and the public also challenged the effectiveness of the compensatory measures proposed by the company. • The local populations livelihood dependency on forests for wood, fuel, livestock purposes and medicinal plants based livelihood remains a crucial concern. The feasibility of the project has been questioned on several other fronts like heavy deforestation limiting the pasture land, impacts of heavy duty blasting on water sources, muck dumping measures, the area's proneness to landslides, avalanches and earthquakes to cite a few. However, the EAC overlooked all these concerns raised at the public hearing and recommended the project for environmental clearance. As per the project's Environment Impact Assessment (EIA) report, land will be acquired permanently from 94 families. 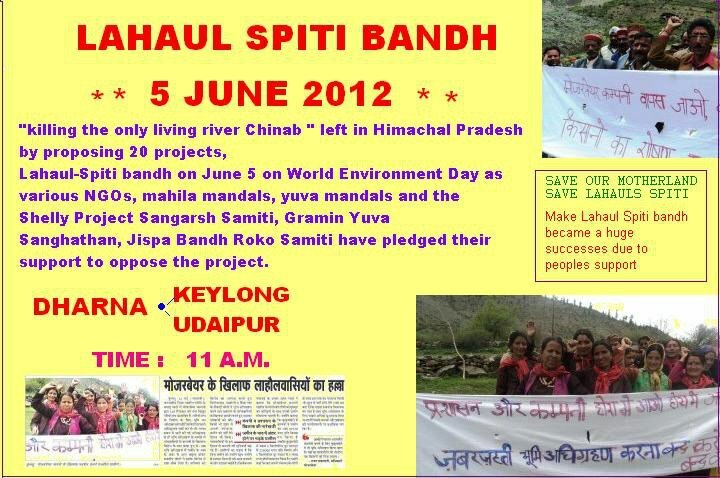 • As a response to the EAC granting the environment clearance, the project affected people from villages such as Udaipur, Namu, Ratoli, Salpat, Koraki,Charu, Aahatu formed a Sangarsh Samiti known as Seli Project Sangarsh Samiti (SPSS). Through means of this people's forum, several memorandums were submitted to the Chief Minister and several rallies staged. In 2011, SPSS also raised the crucial issue of violation of Forest Rights Act 2006 and Panchayat Extension to Schedule Areas Act (PESA) by both the state government and project proponents. On this issue, one of the memorandums by SPSS stated that "under both the acts, the choice of development rests with the community" which was being violated in case of 400 MW Seli project. • The impacts of axing down thousands of Juniper and Cedrus trees and several small and medium variety shrubs on the local ecology is another worry for the local inhabitants.The local environment groups also questioned the manner in which the entire public hearing was conducted. In fact, a legal notice was served to the State government and to the MoEFCC by a local advocate. It questioned the state government's decision of conducting the hearing in the month of November when the Border Roads Organisation officially shuts. The locals felt it was deliberately scheduled in November, in order to prevent residents living outside the valley from registering their protests. • Also the minutes of the public hearing presented to the EAC did not take into account the written submissions by people and only recorded 7 people objecting the project. On the day of the public hearing, the SPSS also registered its protest at the venue, and this fact was not presented before the EAC, nor was it accounted for in the recorded minutes. 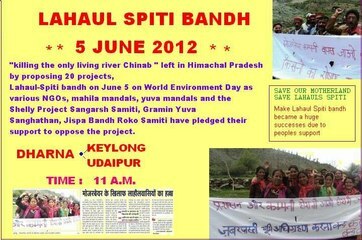 In 2013, again the project affected Gram Sabhas unanimously passed a resolution against the project. 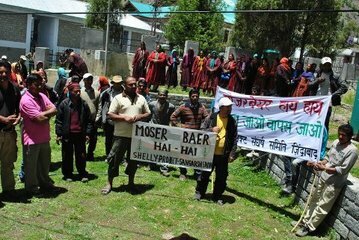 • In August 2014, the Lahaul valley again witnessed fresh protests against hydropower at the stakeholder consultation for Chenab basin's Cumulative Environment Impact Assessment. This was followed by another recent protest against Jispa hydroproject in August 2015. The locals continued to maintain their stand that displacement and massive deforestation is unacceptable to them. Same slogans of "no displacement" and "HPPCL GO BACK" were again hurled at a protest rally organised by the Jispa and Darcha Sangarsh Samiti in August 2015. 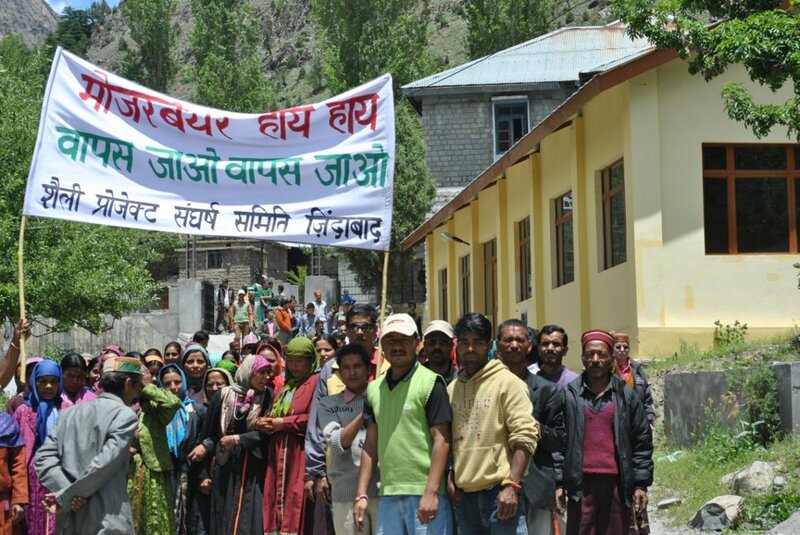 To then cover up the disturbances on ground in order to promote its Green Growth and Sustainable development programme, the State government is dishonest in stating that "a very positive response from the people of Lahaul and Spiti, and Pangi in Chamba District" was received at the stakeholder consultation. The facts and people's organised movement on ground however point towards a different perception of hydropower development. Project Details The 400 MW Seli hydroelectricity project is a Run-of-the-river project proposed on the Chenab river in Shulling village, District Lahaul-Spiti, Himachal Pradesh. The project envisages the construction of 80 m high concrete gravity dam. The catchment area of the project is 6,033 sq. km from the river bed level. The proposed project would have two head race tunnels- of 4.17 km and 4.25 km, respectively. An underground power house is proposed on the right bank of Chenab river near Gugal nallah, close to Kurched village. The other project components include the surge shaft, pen stock, power-house tail race channel, and four units each of 100 MW capacity. Development of Alternatives The local activists and environmental groups continue to maintain "why displacement for development?" stance. Currently, an alternative coming out from groups such as Jispa Darcha Sangarsh Samiti (against 300 MW Jispa) is to develop hydroprojects in areas of the valley where exists no habitation. Another alternative being forwarded is to develop small and micro hydropower projects which are perceived as less socially and ecologically harming. Why? Explain briefly. Locals environment groups claim that the project proponents have been employing strategies to initiate the process of land acquisition. Though the land acquisition process carried out under the land old acquisition was challenged by local ejo's, but it did not result in any substantial action. Much will depend on the Stage II forest clearance which is as of now pending with the state government. However, the local ejo's continue to highlight regular violations mainly of Forest Rights Act and PESA 1996.